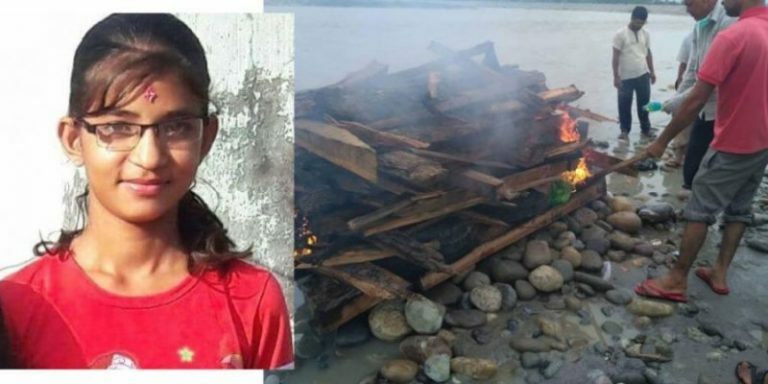 KATHMANDU, July 30: The last rites of Nirmala Panta, 13, who was killed after being raped at Nimbukheda of Bhimdutta Municipality-18 in Kanchanpur district on Thursday was performed in Mahakali river on Monday. Nirmala’s funeral pyre was lit by her father Yagyaraj Panta after the deceased’s family and relatives reached an agreement with the District Police Office on Sunday night. The family demanded swift and stern action against the perpetrator of the crime. Family members and relatives of victim, province leader Prakash Rawal, Mayor of Bhimdutta Municipality Surendra Bista, Ward chairpersons, and journalist were present at the funeral. The victim’s body was found lying on a sugarcane farm on the side of Mahendranagar- Ultakham road. Nirmala had been missing after she left home earlier on Thursday to meet her friend.